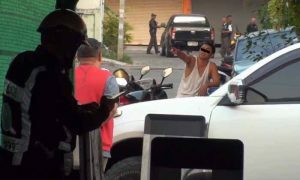 A police captain was shot dead and another is in hospital after a routine call to a disturbance went wrong in Sri Racha, Chonburi. A video showed part of the melee as neighbors yelled out, a shot was fired and a man was seen clutching his side. A Nong Kham police patrol consisting of two officers – Pol Capt Issarapong and volunteer cop Suphasit – responded when neighbors complained that Nirut, 39, was causing a disturbance outside his convenience store at the Torsak Kao market. He was making a loud noise drinking outside his shop. When the police arrived to warn him to be quiet he got angry and went into his shop and retrieved two guns – a 9mm and a .38. As the cops tried to restrain him Issarapong was hit in the left shoulder area and Suphasit in the abdomen. Sanook said that three shots were fired, one in the air and the others at the two officers. Issarapong was taken by medics to hospital where he died later. Suphasit is in a serious condition. Back-up arrived and the area was cordoned off with police not wanting to attempt an arrest as the shooter was armed and still outside his shop. A relative managed to calm him down after some time and an arrest was made. He had not only been drinking – police found Ya Ice (crystal meth), Ya Ba (methamphetamine) and ketamine in his system. Nirut said he was drunk and admitted shooting both officers and was detained pending further investigation.